Food Costs > How Much Does Cereal Cost? How Much Does Cereal Cost? Although most people think of cereal as a breakfast item which is eaten in a bowl of milk, the word “cereal” actually refers to a grain such as wheat, corn, or oats that are used for food. These grains can be made into many items or can be added to different things to enhance the flavor and add nutritional content. 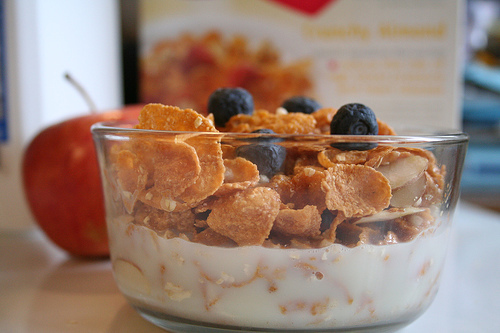 Cereal can be served hot, such as oatmeal, or cold, such as a bowl of Cheerios. How much does a box of cereal cost? The cost of cereal will be anywhere between $2 and $6 per box. The cost will depend on the size of the box (if it is a smaller box or family size), the brand, where you live and the store you purchase it from. The Iowa State University broke down the costs per cup, and according to their findings, a name brand toasted oat cereal can cost close to $0.17 per cup for an 18-ounce box and $0.20 per cup for a 14-ounce box. A generic store brand equivalent would cost $0.11 per cup. Walmart.com, for example, has a list of more than a few hundred cereals. Most of the name brand cereals you are probably familiar will sell for anywhere from $3 to as much as $6 for an 18-ounce box. According to a forum thread on ChristianTeenForums.com, the average forum member paid anywhere from $1 to $5 in their poll. NBC News noted that in 2010, cereal retailed for an average of $2.89 a pound, but in 2015, when the article was published, cereal increased to $3.09 a pound. Commonly sized boxes of cereal will include 18 ounces, 20 ounces, 22.9 ounces, 24 ounces and 42 ounces. Most cereal comes in a cardboard box that will contain a bag of cereal inside, which is meant to keep the cereal fresh for months. Cereal can be geared towards those on a diet, dairy free, gluten free, kosher, lactose-free, low-fat, low sodium, nut free, sugar-free, organic and vegan. Look out for sales. Anytime cereal is on sale, especially if it is a brand you know that you or your family will eat, buy enough until you think it will be on sale again. Almost every week, you should find at least one brand on sale. Any box less than $2 is often deemed a good deal. Also, keep an eye out for coupons. These coupons can readily be available via the company’s official social media website, via their email newsletter or in the local newspapers. Another way to save money is to consider buying in bulk at a local warehouse store. Store brands are going to cost 30-50% less than name brands. Try a store-branded cereal equivalent to see if it’s worth the savings. In most cases, the larger the box is, the more you’re going to be able to save. Pay close attention to the price per ounce to see how which box size is the best for your budget.